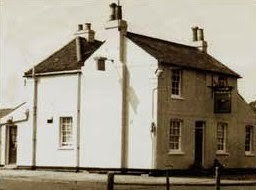 The earliest mention of an ale house in the village is a very tentative one: local historian Judith Hunter found an isolated parish reference to the Small Fox in Eton Wick in the early 1700 's or late 1600’s. The next mention is quite positive and is the recorded fact in the Vituallers Recognizances of 1753 of the Bulls Head and of the Three Horse Shoes (recognizances were pledges made before a court or magistrates). private dwelling. Certainly it became an Ale House before 1753 Vituallers Recognizances and could have possibly have been the first in the village, apart of course from the vague reference to the Small Fox. The other contender for being the first, the Bulls Head, was the end cottage - then the only one - of Hope Cottages, now No 37 Common Road. It was built about 1725 and became an Ale House about 1732. It was run by Elizabeth Griffiths and later her son William. By the mid 1750s it had reverted to being a private dwelling, and then presumably only The Three Horse Shoes survived. After about 90 years it was again used as a Beer House by William Woolhouse. We must remember that the village was very small in the 18th Century. There was no Boveney New Town, no houses South of the main road, very few along the main road and nothing built along The Walk or Sheepcote. Apart from the outlying farms the village had less than 100 inhabitants of all ages, living mainly along Common Road. Back in history we often read of alcoholic drink used to poison. Home made drink and wine in particular varied so much that it was comparatively easy for a host to add poison to his guest's drink. The old practice of drinking one's health and touching glasses was allegedly derived from the good faith habit of each tipping a little of one's drink into the other's glass or tankard. Then when the Host drank the guest was assured Good Health was intended. It is reasonable to believe that Beer sold along Common Road was really a provision for locals, whereas establishments along the thinly populated main road would have served through travellers. In 1830 it is thought that the village only had the Shoes providing beer. That however was the year of the Beer Act permitting any one to sell beer providing they paid a small excise fee. By 1833 the Greyhound was licensed, followed a year later by the Shepherds Hut just outside the village boundary. Eight years later in 1842 we had the Grapes, now known as the Pickwick. It was about this time that William Woolhouse again opened the Bulls Head in Common Road. 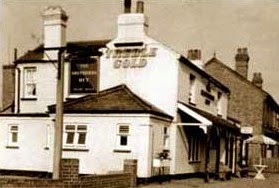 The Three Horse Shoes was the only fully licenced inn until after World War 2; the others were limited to being Beer Houses. Judith Hunter reminds us that in the mid 19th Century there was about one pub for every fourteen families. Today with a population about thirty times greater we still have the same number of pubs, except of course the Bulls Head. It is certain that the Grapes was built on the garden of Common Road Thatch Cottage in 1840 - 42 and squeezed between the terraced row of Prospect Place (one up and one down) ten terraced homes and the row of Hardings Cottages, now the site of Clifton Lodge. A village map of 1839 shows the gap between the two terraced rows. This suggest that the Grapes became a Beer house when it was built unlike the other pubs in Eton Wick. Only in the last sixty years have pubs changed from being "men only", apart from a few clay pipe smoking women, and the spittoon with the sawdust on the floor for people who missed. Of the village pubs only the Grapes was ill suited for the horse and carts or carriages. The Greyhound had stables that were in regular use, certainly from the 1920's to the 40's by Bill Parrot who was one of the two village coal merchants. The row of stables are now the skittles alley. The Three Horseshoes also had several stables and in the 20's and 30's these were used by Roll Bond and his contracting firm. By the mid thirties his sons had replaced the horses with lorries. The Shepherds Hut that for so long stood almost alone just outside the village had a field stretching from Bell Lane to Moore Lane. By the 1880's or thereabout this was reduced to the Brewers field of perhaps half the area and the pub was situated in the N.W. corner. In the late 1940's most of this field was sold to the council for the parade of seven shops and all the houses in Princess Close. Until this time certain local characters always expected to have their own seat or chair and it is well remembered some folk saying, "I will sit here until old Jack comes in". Just before World War II the pubs became more of a social place and regular annual outings took place to the sea and Goodwood Races. This was resumed in the post-war years but of course as we approached the 1960's more and more cars replaced the excitement of a coach trip and involved the whole family. Before this, most Pub outings seemed to be male only perhaps because joining in did not seem ladylike. Probably the Greyhound was the only exception to this practice in the village. Television at this time was also providing in-house entertainment and the social role of the pubs changed for all times. At the Greyhound they probably had the longest serving Publican ever in the village. Bill and Lil Newall took the pub in about 1930 and although Bill died in 1947, aged 62, Lil carried on as landlord to complete 35 years of service. A second opinion claims it to have been 40 years. More startling is the fact that throughout all those years she herself remained teetotal. Mrs Newall was 96 years old when she died in 1984. At the Shepherds Hut there were publicans who nearly equalled the Newall’s long tenancy. Mr and Mrs William Stacey took the Hut in 1899 and like Bill Newall, Bill Stacey died leaving his widow to carry on as Landlord. Mr Stacey died a day or two before Armistice day 1918 and his widow remained at the pub for another 14 years, a total of 33 years. Bill Cobourne followed Mrs Stacey at the Hut and was another long serving Landlord. Unfortunately I am not sure how long he served but probably nearly 30 years. The first Stacey in the village to be Landlord was a William Stacey at the Grapes and the father of William at the Shepherds Hut. 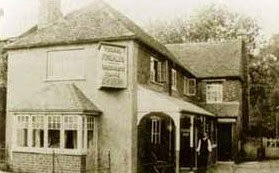 Another son, John, became Landlord of the Grapes, but by the 1920's father William and his two Landlord sons had died leaving their widows to carry on as Landladies. Vic Short of the Three Horseshoes was also a reasonably long serving Landlord but without more research we cannot be sure how long he served. There is a newspaper cutting from the time of the First World War stating that he had unsuccessfully applied for military exemption. It is thought he left the village in 1937. He was followed by that great London character Amy Buck who, it was said, kept two lots of opening hours. One for normal trade and one in the back room for special customers wanting an out of hours drink, particularly American Servicemen. 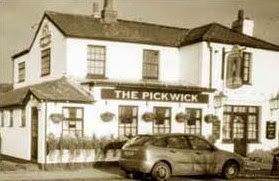 A change of name for ‘The Grapes’ to ‘The Pickwick’ did not bring longterm gain, as competition from off-licence outlets and supermarkets together with the changing social scene brought the closure of the Pickwick in 2004.